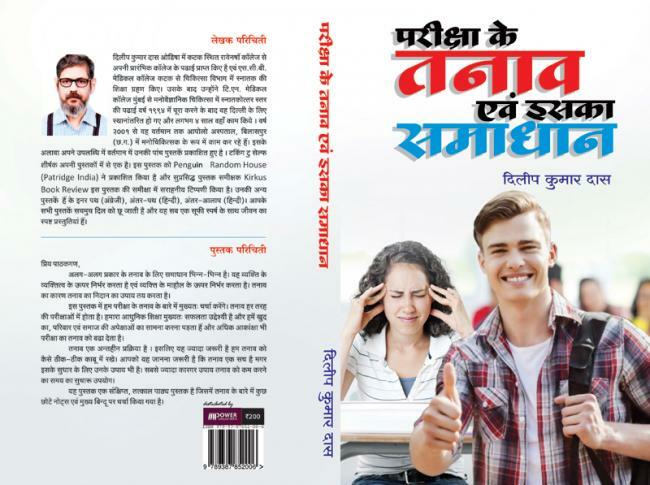 “Pariksha ke tanav evang iska samadhan” written by Dr. Dilip Kumar Das is a book mainly about stress during examinations and how to cope with it. It also talks about the pre and post examination stress and how parents should play a role in helping children to come out of it. Stress is something which is very common and which we all face. But what most of us don’t know is about the long term effects and serious ailments which can be caused by stress. The topic that the book starts with is the reason for stress in our present day life. How to keep an optimistic approach towards life, which ultimately helps to decrease stress. We are becoming self centered and narrow minded about the possibilities of life. We need to open up and look at the brighter side which keeps us happy, says the author. Then the author moves to the main focus of the book - stress in the life of a student. It starts off with how we should study and how our routine should be. We will find that many of us do exactly opposite of what has been written in the book and obviously that is the reason for much of our stress and health problems. There are also simple breathing exercises that help relieve stress. Then the writer educates the readers with some general facts about stress. He throws light on the difference between ‘distress’ and ‘eustress’ (the latter meaning beneficial stress). To make it easier for the reader’s understanding, the writer has also added flow charts of stress cycle. Then we get to know the main reasons behind stress during examination time. The author also highlights on how to know that a student is suffering because of stress, the symptoms to look out for in students. The reasons for stress in childhood and some advice for parents have also been offered. Not only does the book give us knowledge about stress but also guides us in how to prepare for exams, how to study to make it easier for us along with that it also gives us practical examples to make it easier for us to understand how to put the techniques of studying given in the book in our daily lives. The writer also gives some advice on how to stay stress free and what do do before and on the day of examination so that stress does not effect our exams, how to write answers during exam. He has also included what kind of diet and sleep schedules we must follow to stay healthy which promotes a stress free life. The book concludes with advice for the future and models of stress development and memory. This is a must read for each and every student because each one has to deal with stress everyday and has to cope with stressors. Many students are going into depression and the thing that starts off this deadly mental ailment is stress. This is a very helpful book. It is a book not only for knowledge but also for application in our daily life. An amazing book, nicely written, and a large amount of information has been covered in a precise manner. It has been written mainly in point form, which makes it short and apt for readers. It has been written in a very easy language and keeping in mind the age-group for whom the book has been mainly written.